A fast-moving fire swept through a historic district of Bangladesh's capital, Dhaka, killing at least 78 people, officials say. The blaze broke out at night in a residential building that had flammable material stored on the ground floor. Members of a bridal party are thought to be among the victims. It is not yet clear what started the fire. 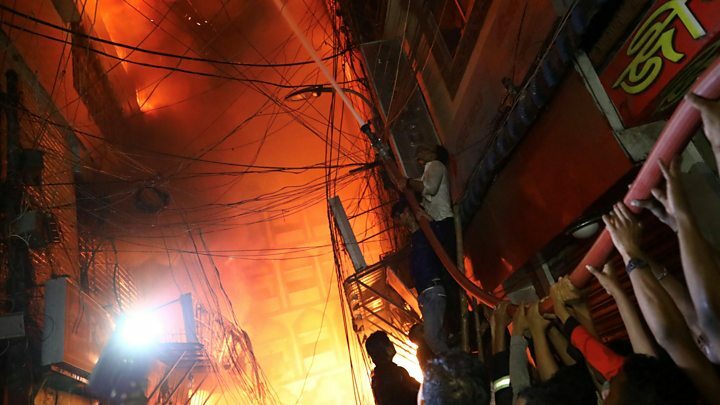 Large building fires are relatively common in densely populated Bangladesh, owing to lax safety regulations and poor conditions. Hundreds of people have been killed in recent years. On Sunday, a fire in a slum in the coastal city of Chittagong killed at least nine people. The fire broke out in a mixed-use building at 23:40 local time (17:40 GMT) on Wednesday, when many residents were sleeping. It started at a chemical warehouse on the ground floor and then raced through three other buildings, officials say. Many people were trapped, unable to escape the flames. Witnesses and police said gas explosions helped fuel the blaze. Mohammad Firoz, who sells cosmetics in Chawkbazar, said 25 of his friends and relatives were missing and that he feared his brother was dead. He said he had seen an electricity transformer explode, causing a minibus parked below to catch fire. Its gas cylinder then exploded, causing a blaze in a nearby chemical shop. "The flames spread so quickly," he told the BBC's Bengali service. He said his brother, Hira, who worked in a nearby pharmacy, closed the shutters of the shop after one of the explosions, fearing there had been a bombing. "I fear he died inside the shop, I am still searching for his dead body." Haji Abdul Kader, whose shop was destroyed, said he had "heard a big bang". He told AFP news agency: "I turned back and saw the whole street in flames. Flames were everywhere." The death toll stood at 78, Dr Sohail Mahmoud, head of the department of forensic medicine at Dhaka Medical College, told reporters. "Up to now, we have 67 bodies in our mortuary and the hospital morgue has 11 dead bodies," he said. Victims included people outside the buildings, some guests at a restaurant and members of a bridal party, AFP reports. Most of the bodies were charred beyond recognition. Some of the injured were in critical condition. The number of victims is expected to rise as the search continues through the damaged buildings. Firefighters fought for more than five hours to put out the blaze, hindered by narrow streets and a lack of water sources. Prime Minister Sheikh Hasina expressed her shock over the tragedy and conveyed condolences to those affected, the Dhaka Tribune reports. Chawkbazar is one of the most important areas in Old Dhaka, a historic district established about 400 years ago during the Mughal dynasty. It is a hub of chemical businesses and local perfume factories, though authorities banned the storage of chemical goods after a deadly fire in 2010. The streets are packed with rickshaws, small cars and people walking around during the day. The lanes are so narrow that passenger buses cannot get through. Electrical, telephone and internet cables hanging above the narrow lanes pose a real danger. But the most serious threat comes from the fact that residential buildings are used for commercial purposes, with ground floors serving as chemical and gas cylinder warehouses. After that incident, a committee suggested the removal of all chemicals warehouses from residential areas, but critics say no significant steps have been taken in the years since. Just one week ago, authorities announced a campaign to identify illegal chemical business in old Dhaka. Similar campaigns have been conducted in the past but none of them were particularly successful. The lack of safety regulations was highlighted in 2013 when more than 1,100 people died and thousands more were injured when a building housing garment factories in Dhaka collapsed. Dhaka has a population of more than 18m people with some 3.5m living in slums, according to the World Bank. It is one of the world's most densely populated cities. Clothing factories: Are they safe now?